Britain's Foreign Secretary William Hague is angered and repulsed by a question at a news conference recently in London. His head and neck are pulled away from the questioner and so are his shoulders somewhat. Also consistent with anger is his active squint. To add to this list, his lips are considerably compressed, the corners of his mouth are slightly down-turned and his nostrils are slightly flared. 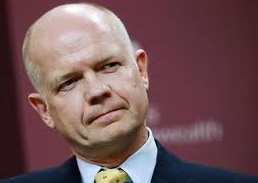 I'm not sure if Mr. Hague wanted to appear angry, but I seriously doubt it. It's the vary rare person who realizes his anger "in real-time" and it's exceedingly rare for a person to be aware of the crescendo of the pre-anger state. Those who study and practice non-verbal communication, while certainly not perfect, improve in this area dramatically.